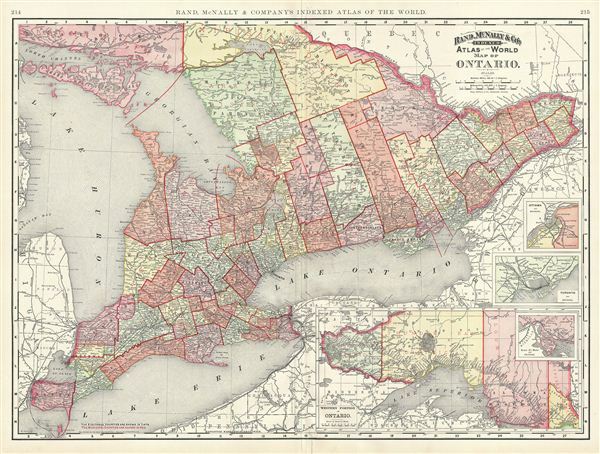 This is a beautiful example of Rand McNally and Company's 1892 map of Ontario, Canada. Centered on Lake Ontario, the map covers Upper or West Canada from essex to Prescott. Four inset maps in the lower right quadrant detail the western portion of Ontario, River St. Mary, Toronto and Ottawa. Both the electoral counties and the municipal counties are named in black and red respectively. All five of the Great Lakes are shown. Although the region suffered economically during the recession of 1893, Ontario continued to flourish in mineral exploitation and industry. Color coded according to political boundaries, the map notes several towns, cities, rivers and various other topographical details with relief shown by hachure. This map was issued as plate nos. 214 and 215 in the 1895 issue of Rand McNally and Company's Indexed Atlas of the World - possibly the finest atlas Rand McNally ever issued. Rand McNally & Co., Foreign Countries. Rand, McNally & Co's Indexed Atlas of the World (Complete in Two Volumes)…, (Chicago) 1895. Very good. Minor wear along original centerfold. Text on verso. Rumsey 3565.060 (1897 edition). Philip (atlases) 1026 (1898 edition).